Took the car out to HMP last weekend for the first time since the last posting above back in November 2014. I haven't changed anything on the tune other than a new set of spark plugs. I put a pair of new/used 28x10.5 stiffwall slicks that I bought 2nd hand with the stickers still on them back around January. I did adjust the rear shock settings by just a few clicks on extension and a couple of clicks on rebound since I was going from a radial to a slick. First pass off the trailer I had the pressure too high as I set them before a burnout. I also did a huge burnout to break the tires in for their first hit. Result a spinning 1.37 sixty foot, 5.6x@128.3 or so MPH. I let the car cool down for a couple of hours and went back up for another hit, now with the tires set at the more desirable 12 psi (set them after I returned from the first pass while still hot). The guy I was lined up next to was taking forever to stage and I didn't look at my temp gauge (we'll return to that in a second). We finally got staged and I launched and she felt good. Really felt like it pull a small wheelie and carried at nearly 100 feet or so, but the video doesn't really show that. 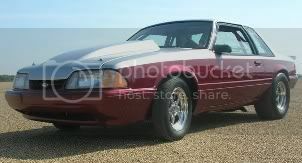 The result was a 1.32 sixty foot on what I thought was the back tires, 5.49@129x4 mph. I did pull almost 100 lbs of ballast out of the car since I wasn't running Ultra Street plus there is some saved weight from the change back to the slick from the radial, so probably 120 lbs lighter. That explains the picked up MPH to me, even though almost everyone will tell you that Radials will pull more MPH on the big end than slicks I think I proved that wrong. Remember when I said I didn't look at the temp gauge? Yeah, that might have been a mistake. At the top end of the track, the radiator cap started blowing fluid out. Apparently my catch can was full and the water had nowhere to go but out the cap, all over my engine bay, and guess what...under the tires too! Yeah I lost it. The car swerved to the right, then to the left, then to the right a little further, then hard left again. It slid for probably close to 200 feet with my drivers side door facing the starting line and passenger door facing the sand traps. Unlike the first time I had this type of wreck back in Oct 2008, this time I had a little more driving experience and managed to steer and save the car. While it was sliding left basically sliding perpendicular to the race track, I kept the steering wheel straight, meaning the front and rear wheels were parallel. I think this is what kept the car sliding in a straight albeit perpendicular path instead of swerving around more and tagging the wall. When the slide started to slow down, I turned the wheel to the left, away from the skid instead of the instinct to turn it into the skid, this resulted in the front of the car moving back towards the finish line and the car came to a stop at about a 45* angle on the track, probably around 100-150 feet from the end of the track. The engine temperature when I came to a stop showed 250*. I jumped out and shut the battery off, took my helmet off and raised my arms and helmet in joy as I had just pulled off an awesome save! Raised the hood and found water everywhere. If you get new tires look into those new M/T radials they are ridiculous. The new Compound is insane and guys are breaking records and hooking on much less radial friendly surfaces very consistent. The Pro-bracket radials are flat out nasty on very little burnout required. This year I decided to start running in the Houston DOT Top Ten Small Tire track car list out at Royal Purple. Hey its cheap racing without the $100 entry and I get to be a part of something with some of the faster grudge racers in the area. I went out to the first event for a Round Robin race to get a shot at the list and took runner up against Ratt Daddy in his BBC powered Luv. He put 3 cars on me, probably on one kit and off the gas LOL. So he got his shot at the list moved up a spot or two, then someone dropped off the list and I got on at #10. A lot of drama ensued with several racers pulling cars off the list because they didn't want to show up to the track every week or for whatever reason. I managed to make my way up to around #6 or so, then it was time for a couple month break. We all agreed to come back and race again around Feb 12 or somewhere around there and some people didn't show up. So those that did show up ended up racing for spots while the other cars ended up getting bumped down. So somehow after the next two races I had raced Steven Talbot 2-3 times and ended up now sitting in the #2 spot right under Daniel Burkes Blazer. Daniel's motor is being freshened and he was offshore working, so me and the guy below me agreed to wait to race again until Daniel was ready. I took that along with some major oil leaks and signs of blowby as a chance to go ahead and pull my motor out, time for a freshen up. The engine is currently sitting at WOP Shop for machine work and parts ordering, then Stacey at All American Racing Engines is going to handle the assembly for me. Nothing major being done to it at this time. It has been rode hard for the last 3 years without an issue until these last couple outings where it burned some plugs. We found 2 pistons with badly lifted Ringlands. The old Bill Miller Engineering Pistons and Rods really stood up for a long time. We're going back with JE pistons and GRP alluminum rods this time around and Stacey says it will handle everything I want to throw at it. At some point as funds permit I may like to install a 2nd nitrous kit in the form of a fogger so I can really get after it. I need to pick up at least another 10 mph and .1 or better in the sixty foot to get more competitive with these top guys. Maybe I'll try some no prep racing this year, we'll see. I did put the car on the street one evening and made 3 test passes. The launch pad was well used with about 60 feet of rubber down, but once you cleared that power management was a major issue. With no delay in the nitrous and a 17% starting ramp with a 2.1 second ramp time, it pulled the front wheels 6" and carried them 30-40 feet on the street until they came down and it cleared the rubber, then it blew the tires off. Next pass we put a .5 delay in and slowed the ramp to 3 seconds and it launched like a turd, then spun about 100 feet out so I aborted. 3rd pass, .2 delay, but over a 4 second ramp and finally able to go down the street under power. I would guess it was around a 6.0 pass on the street, not bad, but nothing like those No Prep guys are laying down. Fast forward 5 months and I'm just now about to pick my motor up this weekend. Builder had a few issues with the assembly and wanted to make sure everything was right so he took his time. I am getting a new little somethin somethin for Christmas to go on the car, but I don't want to let that cat out of the bag until I see how well it runs and try my luck at a little grudge racing. Lets just say it should make a little more power and hopefully get closer to the numbers I've been shooting for for a couple years. I'm hoping to get the motor back in the car in December and ready to test when the tracks open back up in Jan. I could use some new back tires, but funding just isn't there right now. It lives. Video posted on my FB page. What was expected to be a couple hour job Monday morning of installing the headers and connecting a couple of wires turned into most of the day from around 11am until 8pm. The passenger header is a PITA, but I figured out its easier to lay under the car and put the individual tubes in from there and still be able to reach the bolts from underneath. Drivers side not too hard. The problems came when I went to fire it the first time. I was getting nothing, no pop, no nothing, just the engine turning and killing my battery. I heard a tick from under the dash a few times when I hit the starter switch but didn't think much of it because I hadn't done any work under the dash while the engine was gone, just through some parts inside the car for storage. Well after some troubleshooting I figured out the coil wasn't producing spark, then started chasing wires because my volt meter tester took a crap on me. Ended up finding the two wires that feed the coil had spade connectors inline with the feed wires from the digital 6 ignition box which is mounted just in front of the shifter and they had gotten snagged and pulled loose. So I found that and reconnected then established that I now have spark. Still now that I have spark, I'm still getting no fire. I restabbed the distributor a couple of times 180* off then started jumping a couple of teeth and eventually got it close enough that I started hearing some resemblance of a bang. Adjusted it from there and vroom vroom she fired up. Opened up the throttle blades with the idler screw and set timing at 34* total for a start. Ran her up to 180* then shut her down to cool off. Topped off the trans fluid and was out of time by that point, so no trip around the block yet. Found that I have a trans fluid leak when I backed into the garage, I'm assuming from the fittings for the lines, so I'm going to get under there and fix that this week. Gotta figure out how to mount the new solenoid bracket for my nitrous solenoids, I bought the boomerang bracket from nitrous outlet cause it looked cool, however the way I set it up it is touching the back plug wires on the distributor. Going to try flipping the bracket around and see how that works. Been a while since I updated. In February I took the car to the track and had some issues. It went a 10.0x@136 on motor but was sputtering a bit on the top end. Attempted a nitrous pass, spun the tires a little and then it stuttered when I hit 2nd. I loaded up and called it quits. Come to find out the 4 gallons I put in the 8 gallon fuel cell wasn't enough (at least I hope thats what the problem is). The car was very low on fuel and I think after the launch it was sloshing around since I don't have foam in the tank. That said I had decided that I wanted to put the car on the chassis dyno and have Davinci come tune on the carb on the dyno and I would tune the nitrous a little better, but time has just not been on my side. I've been super busy with the kids and family stuff and barely have had a chance to work on the car. I did finally pull the trigger and bought a crank trigger setup as well as making a full ignition switch. The old MSD Digital 6 has served me well for many years all the way from a 400-500 HP 347 on a small shot to an engine making somewhere close to 1k horsepower and going mid 5s in the 1/8. But it's time to grow a little. 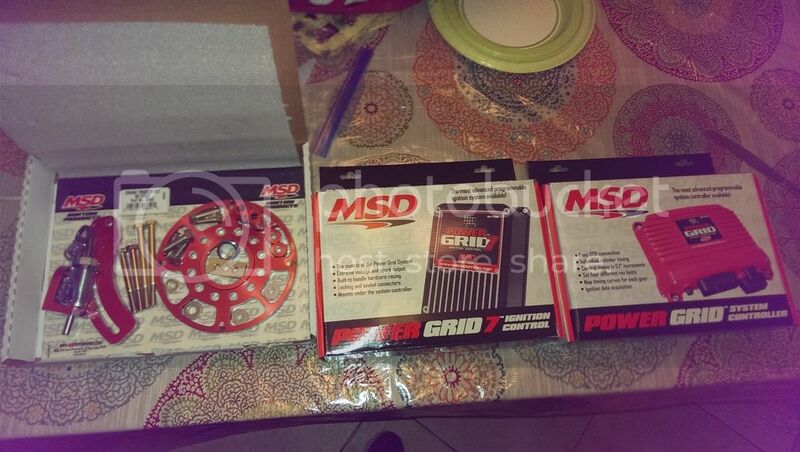 I picked up a brand new MSD Powergrid setup to go with my crank trigger. The crank trigger has been installed and the engine is now running on the trigger with the base timing set at 30*. Next step is to pull the Digital 6 out and do some re-wiring work. I want to build a small relay panel and clean up all the spaghetti wire mess under my passenger side carpet. That's why the car hasn't been back out. I am so tempted to just throw the ignition in there and make it work, but I know the wiring is a mess and needs to be cleaned up. I've taken so long that the No Prep game is pretty much out of my reach as a small tire car. Even with a better nitrous kit and ignition I just don't think this engine/chassis is capable of going 145+ mph in the 1/8 like those small tire guys are doing. So what kind of racing I'll do from here out I'm just unsure. If I can get it close to competitive in no prep I may try it, but I'm not known to spend $200-$300 on entry fee knowing I don't stand a chance in hell of hanging with small tire cars capable of running mid to high 4s in the 1/8. Maybe I'll do 5.80 racing, maybe I'll just grudge race. Powergrid setup is installed and I fired the car up again Sunday for the first time in months. I still have to wire in the wires for the various stages of timing control when on nitrous. The box is actually set up to control 5 stages, but my understanding is that if you run a single kit you can wire all the stages together and just act like multiple kits are on the car with regards to timing. Meaning instead of only being able to pull like 10* total you can pull 10* total per stage. Something like that. I have to learn the thing for sure and now have to remember to bring my laptop with me to the race track. Good thing is I have plenty of buddies with this setup who can help me set up an initial tune. Well, Dr Pepper has sold as a rolling chassis pending pick up this week. Sold with basically everything except the motor and nitrous kit. I have an issue with the engine eating the #1 intake pushrod that I need to figure out, then the motor will be for sale. I posted it on FB for 11k obo for now to see if there is any interests, either way I'll figure out the pushrod issue which I suspect is a lifter oiling hole clogged up. I did buy another car that many old school members here are aware of, belonging to older member Martin Keefer. It was an old True 10.5 car. I bought a new rear for it and will start back racing it next year.